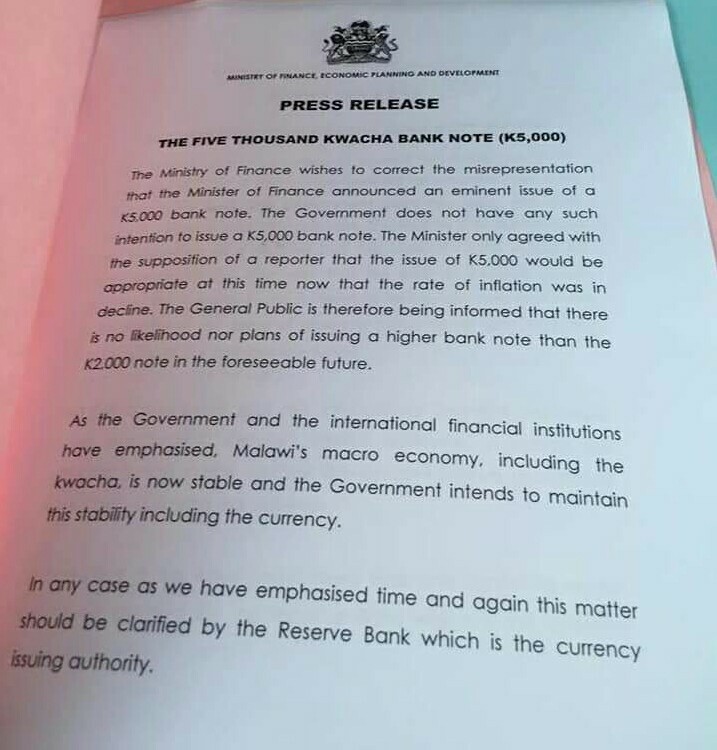 Government has cancelled plans to introduce a K5000 banknote following criticisms from all corners of country. Minister of Finance, Economic Planning and Development Goodall Gondwe on Monday told Malawi News Agency (MANA) reporter that government will soon introduce the new kwacha note, K5000. He attributed the move to K2 000 note has lost value with a lot of it in circulation resulting in the general public carrying large amounts of cash when doing transactions risking their lives and property. Gondwe said Malawi is the only country using a lower banknote. “By the way, do you know that Malawi is the only country in the SADC region with the least banknote? Tanzania has 10,000 bank note and in Uganda is even higher, these denominations save billions of money for a particular country. In brief the monies that are used to finance the production of new currency are very huge. If we have this K5, 000 bank note it will be very good. “On the contrary, if we continue in the situation we are in without coming up with a higher banknote then we continue losing a lot of millions for replacement of the money. It will be laborious to carry a huge bag with money just to buy one item, but with this new note it becomes so simple,” said Gondwe. The development attracted strong condemnation from all corners and some even demanded for the immediate resignation of Gondwe. Due to pressure government has cancelled the plan, saying it has no such intention at the moment.